Candidate technologies for verification under the EU ETV Pilot Programme can be proposed by any legal entity or natural person established in or outside the European Union. The proposer can be a technology developer, manufacturer or its authorised representative. If the technology manufacturers concerned agree, the proposer can be another stakeholder undertaking a specific verification programme involving several technologies (e.g. as part of pre-procurement procedures). Is your technology a suitable ETV candidate? Is it an innovative environmental technology? Is it ready for market? Are the performance characteristics not fully covered by existing regulations/standards? Does it fit within the Technology Area scope of Water Treatment and Monitoring, Energy Technologies or Materials, Waste and Resources? Then, since The EU ETV Pilot Programme is intended for use in a business-to business context, an independent validation of environmental performance will help building purchaser’s trust thus accelerating its market penetration. 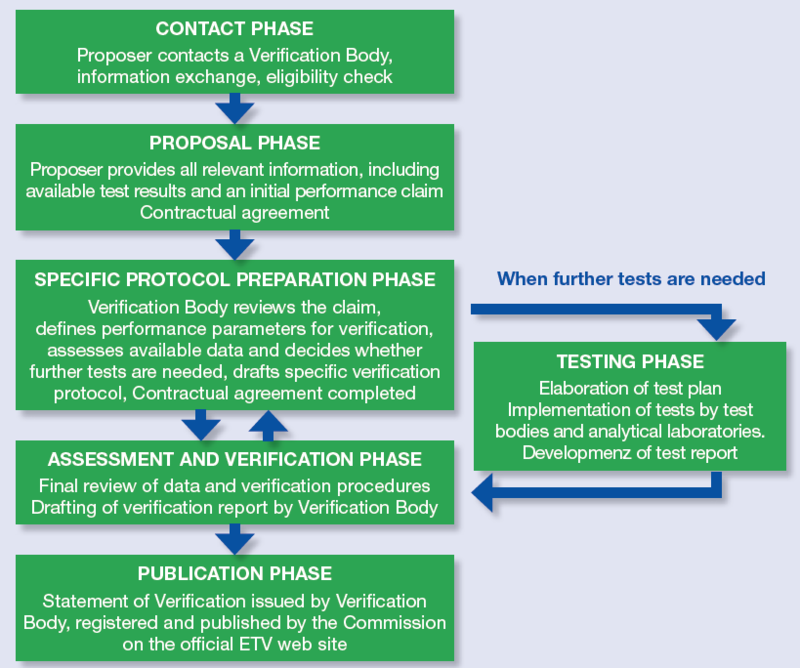 To apply for verification under the EU ETV Pilot Programme, the proposer shall contact a Verification Body which is an organisation accredited as fulfilling the requirements of ISO 170203 to perform verifications under the EU ETV Pilot Programme. Each Verification Body is accredited for a specific technological scope. Therefore it is recommended that the proposer should first check with the Verification Body if the technology to be verified falls in the scope of its accreditation. It is up to the proposer which Verification Body to choose, in the same country where the proposer is established or in another. A list of the Verification Bodies together with the technology areas for which they intend to be accredited can be found here. What about costs and funding? Costs can vary considerably depending on the technology and on the quality of existing data. For example to verify the claims of a technology that is aiming at several markets, for instance treatment of drinking water and wastewater, could mean a longer and more expensive verification procedure. Also, the quality of the pre-existant data is extremely important so as to reduce the need to perform extra testing or even duplicate already performed testing. Hence it is crucial that technology manufacturers get in contact with Verification Bodies at an early stage in the development of the product so as to start a useful dialogue that will increase the chances of a successful verification at lower costs. Horizon 2020 under societal challenges. Some aspects of the integration of ETV proposals in Horizon 2020 can be consulted here.